The minimum load applied on a slab is equal to g whereas the maximum load is equal to p=(γg-1)xgi + γqxqi. Τhe general problem concerns the way that the slabs should be loaded for developing maximum stresses. This is a complicated issue since, even for a simple case of six slabs arranged in a grid seven unfavourable loadings are required, as illustrated in the following figure. The analysis of such a simple example via tables can be performed only for equally grid axes. The problem becomes even more complicated when slabs are not arranged in a grid. General and accurate analysis can only be achieved by means of the the finite element method. However, the resources for such an analysis require sophisticated algorithms and modern computers. The related software performs parallel processing of such algorithms on all available cores of a personal computer providing solutions to such complicated problems within seconds. The unfavourable loadings on the three previously resolved examples will be examined next. 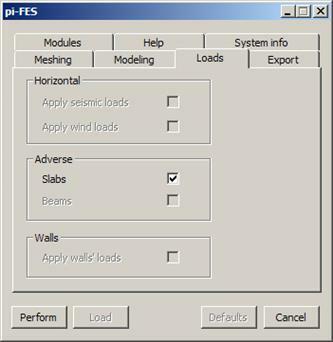 Calculations, taking into account the unfavourable loadings, are performed by selecting "Adverse\ Slabs"  in the tab 'Loads' of pi-FES interface. Results are displayed by pressing, "Adverse" ? and the stress resultant required e.g. "Shears"?.